If you enjoy this article, check out the rest of Protagonist Soccer’s Halloween Week Special, Cracking the Crypt. Gothic Horror made its way into popular fiction as early as the end of the 1700s with works by English authors Horace Walpole, Ann Radcliffe and Matthew Lewis—by the mid-19th century, serial pieces and novels by Edgar Allan Poe, Mary Shelley, and Charles Dickens were readily available throughout western culture. Vampirism was very much an early component of Gothic writings with pieces by John William Polidori (The Vampyre, 1819) Rymer and Prest (Varney the Vampire serials, 1845-47), or Irish author Sheridan Le Fanu’s lesbian vampire work (Carmilla, 1871-72). This creature of the night was fast becoming one of Gothic Horror’s most well-known archetypes. Often, a literary goal of working with these archetypes (Scapegoat, Villain, Temptress) was more meaningful than simply telling a spooky story, there was an element of revealing darker sides of humanity to the reader, almost with a didactic sensibility. As these works of fiction became increasingly available, they also became increasingly influential for new waves of writers as well as readers. By the 1890s, the word vampire had taken on a meaning beyond that of a literary sense and began to permeate everyday vernacular. Even in the farthest-flung cities of western civilization, like San Francisco, creatures from Gothic writings were now portrayed in daily media. In regards to an issue we can relate to in modern times, this 1882 political cartoon portrays the landlords of San Francisco, as Vampire bats, looking to drink the tenants dry. These Vampires, of course, ate and drank merrily; however, ended up in hell for squeezing every last cent out of their renters. At a certain point, those privileged enough to be in a position of this level of mockery, begin to own it—they would rather on-board the titles of “Scrooge” or “Vampire” than succumb to social pressure and give up their positions of leverage. Calling oneself a Vampire in these terms becomes a bit of self-scathing or sardonic humor, and maybe simultaneously allows them to explain away not knowing how to sleep at night. The game of association football, or soccer, had been played in Britain for centuries, but had only been codified for a relatively short period of time--1863. As Britannia spread their literature and financial system around the world, they brought with them the laws of their exciting new sport; wherever sailors travelled, be it to continental Europe, South America or even the port cities up and down California, they brought with them the game of football and all of its glorious Victorian Era laws. While sailors came and went, the clerks, merchants, bankers or property managers might stick around longer and since they might have been members of Cricket Clubs or Yacht Clubs back home, this budding white-collared class set up similar clubs in their respective new locales. Organizations, such as the San Francisco Yacht Club or the Encinal Yacht Club were forming as early as 1890, all around the San Francisco Bay. They would throw elaborate social events and parade their decorated yachts for onlookers to see. Popular destinations around the bay to sail to were fellow Yacht Clubs like San Leandro, Redwood City and San Francisco’s Corinthian YC. Simultaneously massive athletic clubs, like the Olympic Club in San Francisco or the San Francisco Italian Athletic Club were assembling to provide common areas for athletic competition and fraternization. As football became a larger part of life in the late 19th centuries, these existing athletic organizations added soccer teams to their organizations in the late 1890s. 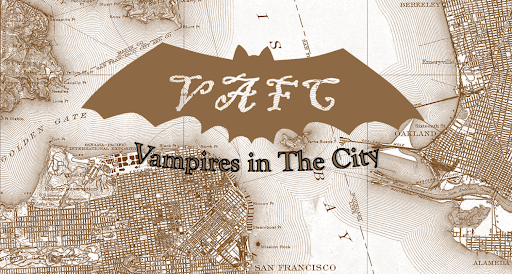 From this you get some of the most historic clubs in Bay Area soccer history: Pastimes, Pickwicks, Thistle, Albion Rovers, Pacific Wanderers, and even a club from Alameda calling themselves the Vampire Association Football Club. Initially, there were only four clubs, we know of, founded as early as 1892 and played a bit of a round robin for two years; however, the economic boom of the gilded age (1870s to end of the 1880s) came to a screeching stop just before 1894, in what is referred to as the “Panic of 1893.” These clubs didn’t stop playing soccer, it was just more intermittent for several years; they would have to find competition against teams of visiting sailors or travel by rail to play clubs some distance away. Shortly after an economic recovery, Vampire Association Football Club was formed in either 1896 or 1897—it very well could be 1896 and they simply didn’t play their first matches until the following year. They came from Yacht Clubs, Cricket Clubs, Athletic Clubs and the white-collared business professionals who brought with them the understanding of football, were privileged enough to have had access to some of the aforementioned Goth literary classics during their formative years. Vampire Association Football Club were established, perhaps, shortly after Bram Stoker’s seminal novel Dracula had been published in May of 1897. Rudyard Kipling’s Poem, The Vampire, was also released in 1897—which makes the year an oddly influential year for Gothic Horror and vampirism. Considering the players for Vampires, were clerks, bankers, accountants and independent business owners, it’s likely they ran in the same circles as landlords and property investors—those who would laughingly take ownership of the socially derogatory expression “Vampire” and use it as a mascot for a newly formed football side. There’s no way to know if this is true, but its as good a guess as any. There’s also the likelihood that they came to consensus, while inventing a name for their side, that Vampires just sounded good and scary. According to The History of Soccer in the San Francisco Bay Region website, maintained by David Litterer, “… soccer first made its appearance in Northern California in the late 19th Century; soon the California Football League, Western League and other circuits were founded, which eventually led to the formation of the California State Football Association in 1902.” Just two years later, the State FA would launch the State Cup as well as the Bellis Perpetual Trophy. 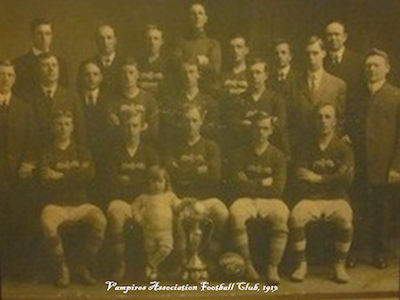 Vampires were amongst the early powerhouses of these competitions, along with names like Union Works, Burns, and of course, they’re local rival, the Barbarians—who can boast having won the State Cup three times and the Bellis Trophy once. Litterer provides the lists of silverware in the Vampires’ case: State Cup in 1907, 10, 14 and the Bellis Trophy 1910 and 11… and looks like they did the triple in 1910. In their centenary celebration, the San Francisco Soccer Football League released a 20-page document, making a list of the league winners available. The Vampires from Alameda managed to win the league in both 1908 as well as in 1910… Barbarians only managed to win the league once, in 1923. Sean McGeever, author of a lengthily bit of history content provided in the league document, tells us “Founded in 1902, the SFSFL is, in fact, one of the oldest semi-professional leagues in the United States… One of the early teams in the league, the Vampires, sported a bat on their jerseys, and rumor has it, drew first blood every game!” This, and the few remaining team photos, can confirm the jersey recreations by Brian Bunk are accurate (Shown above, courtesy of @SoccerHistoryUS). Vampires’ 1923 season was a disaster, according to J.N. Young’s report in Spalding’s Soccer Football Guide of 1923, “From the start, the competition was keen and Olympic and Union Iron Works were generally considered as the most likely contenders. Yet it could not be said that they dominated the other teams which, with the exception of Vampires and later Burns, kept well in the fighting line...” The club from Alameda finished dead last, they showed no fight all year and were bottom of the table with no wins and gave up thirty more goals than they scored. On the other hand, they fought hard in the State Cup, forcing replays in the first and second rounds, as well as in the semi-finals. After each draw, they would follow up with a win in the replay. Vampires even, somehow, forced a reply in the Cup Final, drawing newcomers McKinley Park 3-3 away. On the home leg, they lost the final 1-3 and that may have been the proverbial stake in the heart for the Vampires in the City. If the club vanished into thin air or put itself to rest in a coffin, Vampire Association Football Club was not mentioned in any available sources after 1924. For a short while, however, the frightful club from Alameda California haunted the football grounds of the Bay Area and even made a meal of their competition. There is every chance that several of Vampires’ players were not done playing soccer just because the team didn’t show up for any more seasons in the SFSFL, and they might have found somewhere else to play. The San Francisco Soccer Football League is still up and running, with many current clubs who can trace their lineage back, through mergers and moves, to the clubs of yesteryear and maybe… just maybe there was a vampire or two who played for them too.